Damage by hurricane "San Ciriaco"
The history of hurricanes in Puerto Rico starts with the arrival of Christopher Columbus to the island in November 19th, 1493. Even though the island was "discovered" that year, the first Spanish settlement in Puerto Rico was established years later by Juan Ponce de León. This is the reason for having the first official records of tropical cyclones passing through Puerto Rico in the first decade of the 1500s. From that time on we have records of tropical cyclones in Puerto Rico until the present times. The naming system of storms here was based on the catholic tradition of naming the storm with the "saint" of the day (e.g. San Ciprián on September 26th). There was also the case that storms repeated in the same day on different years such as with San Felipe I and San Felipe II on September 13th, 1876 and 1928 respectively. This tradition of naming storms that way ended with hurricane Betsy on 1956 which is still remembered here as “Santa Clara”. Years later with the passage of hurricane Donna in 1960, the storm was recognized as “San Lorenzo”. First tropical cyclone in record in Puerto Rico. It was reported by Juan Ponce de León when his ship was brought to the shore by the high winds and waves in the southwest coast of Puerto Rico. The southwest area was the most affected. There are strong doubts if this storm was in 1513, 1514 or 1515. Historians in recent times have been leaning more towards 1514 as the date. A lot of Indians died due to the plagues and lack of food. In the “West Indies Documents” there are the reports of the treasurer of Puerto Rico reporting the damage by the storm in Puerto Rico to the Crown in Spain. 1526, October 4th-5th; Hurricane “San Francisco"
Reported as a violent hurricane that moved slowly over the north of Puerto Rico and affected the Dominican Republic on October 5th. This hurricane caused extensive damage and widespread flooding. First of 3 tropical cyclones that affected Puerto Rico that year. Some historians talk of 5 tropical cyclones that year, but 2 of them are doubtful. Affected the entire island and destroyed half of the houses in San Juan, some historians estimate the storm passed in July 28th. Puerto Rico had a population of 3,100 inhabitants based on that year’s census. Affected the entire island with extensive flooding and a lot of crop damage. Violent hurricane that caused more extensive flooding and crop damage. There was so much suffering that many of the residents considered leaving the island. Some historians talk of 3 tropical cyclones that year, but because of the lack of evidence only one can be attributed. The storm caused extensive damage to agriculture and widespread flooding. Many deaths were attributed to the storm, specially of slaves. This hurricane was reported by ocular witness in the Dominican Republic and it is presumed that it affected Puerto Rico. Apparently it was a large slow-moving storm that caused a lot of rain but was not very intense in terms of winds. Based on historian Alejandro Tapia, this was the first tropical cyclone designated with the saint of the day. The earlier tropical cyclones were designated by historians years later after their passages. This was a severe hurricane that caused widespread damage in San Juan and in Santo Domingo on August 25th. Last tropical cyclone in Puerto Rico in the 16th Century and the first of 5 to occur in the Saint Mathew’s Day (Día de San Mateo). There are no details about its effects and trajectory. This century has almost no cyclones reported but there is the assumption that some were not reported due to the lack of communication and the big crisis of abandon and lack of communication with the other Spanish colonies and Spain that the island suffered during this century. This crisis left the island basically drifting in a social and economical stall. This effects were felt directly in the records of hurricanes in that time because little or no information was almost every time found due to the lack of reports of every kind in that period. Severe hurricane that caused extensive damage to the San Juan Cathedral, to the agriculture and the sugar crops. There were several deaths and in the San Juan harbor some ships with cargo sank. Due to the lack of food, much of the food had to be imported from the neighboring islands. This was the first tropical cyclone to hit the island since “San Mateo” 40 years earlier. Apparently the storm passed trough the northern coast of the island. Caused near 30 deaths and in the San Juan Bay 30 ships were sunken. Based on reports it was a severe hurricane of big size and strength. They day of passage is unknown and because of that the storm has no name. Destroyed houses and affected the agriculture. Years earlier the cacao was started to being cultivated and it was badly affected. Unknown day of passage. Caused big damage to the agriculture which caused lack of food. It ended destroying the cacao crops which were abandoned because no one took care of them later. Some historians say that from 1657 until the end of the century there were other cyclones in Puerto Rico but the evidence is not very clear. The 18th Century is much more active in terms of tropical cyclones in Puerto Rico because the reports are more complete and frequent. Since the last cyclone there have been already 56 years until this hurricane hit Puerto Rico. Caused a big storm surge in the south coast and it is estimated that a lot of damage was cause to the south side of the island. Occurred 4 weeks after the last storm. Passed close to the south of the island and affected the Dominican Republic. Caused a lot of storm surge damage in the south coast. Passed over or near the northeast side of the island. Caused some damage in San Juan, the most important was the “Nuns Convent” in San Juan that lost its roof. Not much information on this one, only that it passed to the south of the island and caused damage to plantations and houses. Exactly eight years after the last storm occurred a tropical cyclone with the same name but with hurricane strength at this time. Caused extensive damage to houses and agriculture and San Juan was badly affected. It is estimated that it entered in the eastern side of the island, crossing it and later affecting the Dominican Republic. The route of this storm was interesting as it entered the Caribbean Sea by Guadeloupe then moving west-northwest close to St. Thomas and changing west over the south side of Puerto Rico then to the south of Hispaniola on September 13th. Caused a lot of flooding in the south side of the island affecting agriculture, San Juan did not report much damage. This hurricane passed close to the south of the island then later affecting the northeast of the Dominican Republic. The city of Ponce reported the most damage. Second hurricane of that year in Puerto Rico. Affected San Juan and the northern side of the island, apparently it was not a strong hurricane. Passed at some distance north of the island after affecting St. Thomas and turning more west-northwest. Strong south winds caused high seas in the south coast of Puerto Rico causing damage to some English ships. This resulted in the occupation by some of the locals of one of the ships that was brought onshore by the storm. 1751, August 18th; Tropical Storm "San Agapito"
The storm affected the entire island and it is possible that the route was across the island from south to north. An earthquake was reported during the passage of the storm. 1766, September 19th; Hurricane "San Genaro"
Severe hurricane that affected the east half of the island. Caused damage to rice, corn, bananas, coconuts and other crops. The trajectory of this storm is very doubtful as it passed over Monserrat in September 13th possibly turning after that passing over northeast Puerto Rico 6 days later, which is too much time. 1766, October 7th-8th; Hurricane "San Marcos"
Passed over Guadeloupe were a storm surge combined with a river overflow created a big flooding. Crossed Puerto Rico from southeast to northwest causing the worst damage in the east side even though it affected the entire island. 1767, August 7th; Hurricane "San Cayetano"
Passed somewhat retired from the south of the island. Caused big flooding and damage to crops. In the island of Martinique 1,600 people were drowned. 1772, August 28th-29th; Hurricane "San Agustín"
It was a strong hurricane that passed trough the Leeward Islands, then St. Thomas, crossing Puerto Rico from Fajardo to Mayaguez and affecting Hispaniola. Damage in Puerto Rico was severe. 1772, August 31st; Hurricane "San Ramón"
Second hurricane of the year, passed only three days after the last hurricane. Affected the island of Barbados then moving northwest towards the Leeward Islands and St. Thomas passing over the northeast side of Puerto Rico with lesser damage than the earlier storm. 1775, August 1st; Tropical Storm "San Pedro"
"Saint Peter" passed close to the southwest corner of the island then over the Dominican Republic. Its effects are unknown. 1780, June 13th; Tropical Storm "San Antonio"
Only cyclone on record in the month of June in Puerto Rico. Passed close or just south of Puerto Rico then over the Dominican Republic. Damaged an English ship in the south coast. Affected crops and properties in Puerto Rico causing a lot of damage in the Dominican Republic. 1780, October 14th; Hurricane "San Calixto"
Known as the "Great Antilles Hurricane" is one of the most infamous and damaging of all times. The hurricane dismantled Barbados with winds estimated in close to 200mph destroying trees completely until flying. In St. Lucia it caused 6,000 deaths and in Martinique it caused 9,000 deaths in part due to the storm surge. The center of the hurricane passed close to the southwest tip of Puerto Rico then over the east side of the Dominican Republic turning towards Bermuda were it sank 50 ships. Damage in Puerto Rico was not very important but this storm was included in the list due to the importance of the damage it caused. Affected severely St. Vincent and Grenada. 1785, September 25th; Tropical Storm "San Lupo"
Passed over Puerto Rico causing severe damage, mainly in the rural areas. For the first time a governor (Juan Dabán) visited the island to offer relief and inspect the damage. 1788, August 16th; Hurricane "San Roque"
Hurricane that passed south of the island but due to its large size affected it entirely. This was the last tropical cyclone of the 18th Century in Puerto Rico and by this time the island had 35 localities and population of 100,000 people. 1804, September 4th; Hurricane "Santa Rosalía"
First hurricane to affect Puerto Rico in the 19th Century. It passed north of the island without much important damage. Later the storm affected very hard the city of Charleston, South Carolina. 1806, September 11th, Hurricane "San Vicente"
Affected severely Dominica causing 131 deaths. Passed south of Puerto Rico causing a lot of damage in Ponce. 1807, August 17-19; Hurricane "San Jacinto"
A very slow-moving storm that affected the island for 50 hours. Flooded all the rivers and destroyed much of the crops. Loss of life was big. The storm moved over the Leeward Islands then over the Virtin islands, then crossing Puerto Rico from southeast to northwest before passing over the Dominican Republic. 1813, July 23rd; Tropical Storm "San Liborio"
Caused a lot of damage in the southwest part of the island, specially to the coffee crops. 1813, August 21st; Tropical Storm "Santa Juana"
Affected Dominica before passing close to the south of Puerto Rico, then the storm affected South Carolina. Damage to agriculture. 1814, July 23rd; Tropical Storm "San Liborio"
One year after, the same day another tropical cyclone passed close to Puerto Rico. Again the storm affected hard the south side and it was felt in San Juan. At the time the storm passed there was a 7 month drought but the passage was not very helpful because it destroyed the crops. 1816, September 18-20; Hurricane "San José de Cupertino"
Passed over Martinique and then close or over the south coast of Puerto Rico. Damage to crops. 1818, September 22nd, Tropical Storm "San Mauricio"
Cause minor damage to the island. The passage of this storm is unclear, it is reported that it was felt in the south side of the island, specially in Guayama. 1819, September 21st-22nd, Hurricane "San Mateo"
It was a severe hurricane. Moved over the Virgin Islands causing 101 deaths then over Puerto Rico the night of September 21st. The storm sank a lot of ships in San Juan and it is estimated that this storm destroyed most of the houses and crops in Puerto Rico. 1824, September 9-10; Hurricane "San Pedro"
Passed very near the south coast affecting mainly the area from Juana Díaz to Cabo Rojo. 1825, July 26-27; Hurricane "Santa Ana"
Santa Ana is one of the strongest hurricanes in record in Puerto Rico. Caused 374 deaths and 1,200 injured. Made landfall in Puerto Rico at 11pm in the area of Humacao and Yabucoa leaving the island by Arecibo and Vega Baja at 8:30am. Affected mainly the east, north and center of the island, the southwest was not much affected. This is the second storm to cause more deaths in Puerto Rico's history only after "San Ciriaco" in 1899. In San Juan the storm decimated the poor suburbs leaving the city without communication to the rest of the island. Apparently the storm was small in size, if it were larger the storm would have destroyed the entire island. Guadeloupe measured a pressure of 27.10 inches of mercury or 918 millibars. The storm's intensity in Puerto Rico is estimated to be around category 4 force with winds of around 150mph. 1827, August 17th; Tropical Storm "San Jacinto"
Crossed the island from southeast to north affecting the agriculture. In the harbors around the island some ships were sunk. 1835, August 13th; Hurricane "San Hipólito"
Crossed the island from southeast to north lasting around 6 to 7 hours over land affecting mainly the east and north of the island. This storm passed north of Hispaniola, over Cuba and affected Galveston, Texas. 1837, August 2nd-3rd; Hurricane "Nuestra Señora de los Angeles"
It was a severe hurricane that crossed the island from southeast to north in a period of 10 to 12 hours. The first storm to have a barometric reading in Puerto Rico were San Juan got a minimal pressure of 28.00 inches of mercury or 948 millibars. In San Juan the storm killed 11 people and sank some ships. 1851, August 18th; Hurricane "San Agapito"
Passed very close to the southwest side of the island but the effects took all of Puerto Rico. The storm was estimated to have winds of around 100 mph sustained when the closest point of approach 1. Big damage to agriculture. The storm entered Florida by the city of Apalachicola on August 22nd. 1852, September 5th; Hurricane "San Lorenzo"
The storm made landfall in southwest Puerto Rico with winds estimated in the area of 70 mph to 80 mph 1. Affected the southwest side of Puerto Rico causing big flooding and damage to Guayanilla and Mayaguez. 1867, October 29th; Hurricane "San Narciso"
One of the strong hurricanes of Puerto Rico's history affected the entire island. Caused 211 deaths because of the flooding. The storm passed directly over St. Thomas the afternoon of October 29th with estimated sustained winds of 120 mph and a reported pressure of 952 millibars 1 causing 600 deaths by drowning and in the bay 50 ships sunk. The storm made landfall in Puerto Rico at around 5-6 pm somewhat weaker than when it hit St. Thomas passing over Caguas and leaving the island in the west. The rare thing with this storm is that with such insignificant pressure readings (29.60 in/hg or 1002 mb in San Juan and 29.40 in/hg or 995 mb in Arroyo) the storm caused so much damage. The first tropical cyclone were the wind speed is known. 1871, August 21st; Hurricane "Santa Juana"
This is the first tropical cyclone in which Puerto Rico got the warning of the storm coming because the telegraph and the ultramarine cable was already working in the Caribbean. The storm passed over the Virgin Islands and a message was sent to San Juan. The eye of the hurricane moved over the Virgin Island and around 20 miles northeast of Puerto Rico with estimated sustained winds of 120 mph 1.St. Thomas got a pressure of 28.40 in/hg or 962 millibars and 27 deaths. The storm passed just north of San Juan with a pressure measured of 29.53 in/hg or 1000 millibars. Damage in Puerto Rico was minimal. 1876, September 13th, Hurricane "San Felipe I"
One of the worst hurricanes in the 19th century affected the island by 10 hours crossing it from east to west. The storm made landfall with estimated sustained winds of 100 mph weakening and with a pressure report from Mayaguez of 991 millibars 1. San Juan got winds of 60mph and a pressure of 29.20 in/hg or 988 millibars and a rain total of 4.71 inches. This is the first storm were rain was measured in Puerto Rico. A total of 19 deaths was associated to the storm, by this time the first daily weather observations were done in Puerto Rico. 1878, November 28th; Tropical Storm "San Rufo"
First tropical cyclone to affect Puerto Rico in the month of November. The storm passed just over the south coast of Puerto Rico in a just south of due west direction with estimated sustained winds of 70 mph 1. The storm was felt in the east and south of the island with San Juan reporting winds of 20mph and a pressure of 29.64 in/hg (1004mb). Little damage reported. 1888, September 1st-2nd; Hurricane "San Gil"
Passed some 100 to 150 nm north of Puerto Rico estimated as a category 1 hurricane 1. The effects in the island were the heavy rains which caused over 100 deaths due to river flooding. This hurricane is similar to Donna in 1960 which had the same tragic effect in Puerto Rico without passing over the island. 1889, September 3rd-4th; Hurricane "San Martín"
Passed near St. Thomas with estimated sustained winds of 105 mph at a distance of around 40 nm from the northeast tip of Puerto Rico and at around 90 nm northeast of San Juan 1. Damage to banana crops only. Winds of 48 mph were measured and a pressure of 29.43 in/hg (996mb) in San Juan and 29.30 in/hg (992mb) in Humacao. 1891, August 19th-20th; Hurricane "San Magín"
The eye of the hurricane passed close to the southwest tip of Puerto Rico in a west-northwest direction with estimated sustained winds of 100-105 mph 1. Big flooding was reported in the island with the city of Carolina 6 to 8 feet under water. This was one of the deadliest hurricanes in the Antilles were it killed more than 700 people in Martinique. 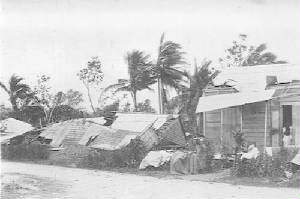 1893, August 16th-17th; Hurricane "San Roque"
Entered the island by Patillas at 7-8 pm and left Puerto Rico by 3am in Isabela. The storm was estimated to have sustained winds of 115 mph at time of landfall 1. San Juan got 29.17 in/hg (987mb) pressure and winds of 55 mph with rains of 2.36 inches. This is the first storm were flags were used to warn people of a storm coming, this was done in the goverment offices. The hurricane affected hard the railroads. 1896, August 31st-September 1st; Hurricane "San Ramón"
Last hurricane in Puerto Rico under the Spanish control. Crossed the southwest area of the island making landfall in the vicinity of Ponce with estimated sustained winds of 100 mph. 1899, August 8th; Hurricane "San Ciriaco"
1) The last hurricane of the 19th Century. 2) First hurricane with Puerto Rico under the control of USA. 3) The natural disaster that has killed most people in Puerto Rico's history; 3,369 deaths. 4) The storm that has caused more rain in 24 hours with a total of 23.00 inches in Adjuntas. 5) First tropical cyclone with a rain map in Puerto Rico and the first under the National Weather Service (NWS) in Puerto Rico. San Ciriaco formed near the Cape Verde Islands and crossed the Atlantic towards the Antilles, then moved towards the United States turning east over the North Atlantic towards Europe. The hurricane made landfall in southeast Puerto Rico at around 8am with estimated sustained winds of 140-145 mph and a pressure of 27.75 in/hg or 939 millibars leaving the island around 2pm in the vicinity of Aguadilla 1. The storm's hurricane wind radii was of 80-85 nm and the rain area was of around 385 nm. Pressure in San Juan was of 29.17 in/hg (987mb) and rain totals of 6.37 inches. In Mayaguez the winds picked up to 112mph and a pressure of 28.86 in/hg (977mb). In 48 hours an average of 10.1 inches of rain was estimated for the entire island. That is the normal rain rate of 2 summer months in Puerto Rico. During the hurricane a total of 890 people died and 1,294 were drowned. Some injured died later and the total was elevated to 3,369 deaths. Damage estimates to property were a total of $35,889,013 3. In the article "La marejada ciclónica de San Ciriaco" or "The Storm Surge of San Ciriaco" 2 it is mentioned the deadly storm surge that entered in the area of Humacao near one mile inland in some places with the winds coming from the east (onshore) in the northern eyewall of the storm. Storm surge estimates are of at least 15 feet in the area which has places like Punta Santiago which are several feet below sea level and were entire families were lost in the storm and were never found after. San Ciriaco was the deadliest storms in Puerto Rico and is also on record as one of the strongest to hit the island and still more than a century after its passage is a storm that deserves to be studied in every aspect. 1. Data taken from the "Atlantic Hurricane Re-Analysis Project" by Dr. Chris Landsea, Bob Hart & Andy Solow. 2. "El Nuevo Día" article "La marejada ciclónica de San Ciriaco" of June 22nd, 1997 by Angel L. Rosado Bauza "Historic Cyclonic Puerto Rican Society". 3. Much of the information of damage and some pressure reports found from the book "Historia de los huracanes en Puerto Rico" or "History of Hurricanes in Puerto Rico" by Edwin Miner Solá (1995). 4. National Hurricane Center (NHC) tracking maps used. 5. Historical photos of damage taken from different sources such as the "Puerto Rico General Archives"
Flooding by hurricane San Ciriaco in Arecibo, P.R.